Welcome to a South African yurt getaway! 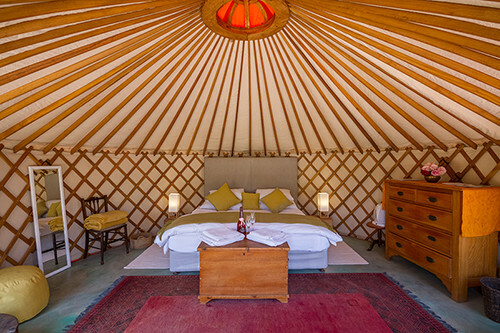 Yurts have become stylish weekend escapes in the UK, Europe and many other parts of the world. Now, Southern Yurts is bringing this unique experience to the Overberg! Stay in the comfort of your own yurt: enjoy a local wine while watching the sunset over the nature conservancy, a walk through our Secret Forest, or a candle-lit shower under the stars. Yurts have become stylish weekend and holiday homes in the UK, Europe and many other parts of the world. Now, in collaboration with Southern Yurts, a Cape Town-based company, you can explore this unique experience to the Overberg! Nestled on a sloping hill that overlooks the raw beauty of the nature conservancy, the North-facing yurt is positioned for the perfect sunrise and sunset. Walk out onto a landing that has been built out of a 90-year old stone wall, and into your private kitchen with outdoor fireplace. A couple of meters away you can enjoy the comfort of a hot shower in our beautiful and enclosed bathroom unit. Nothing about this accommodation is ordinary – if you’re looking for an original and comfortable stay in breathtaking nature, the yurt will provide it all.